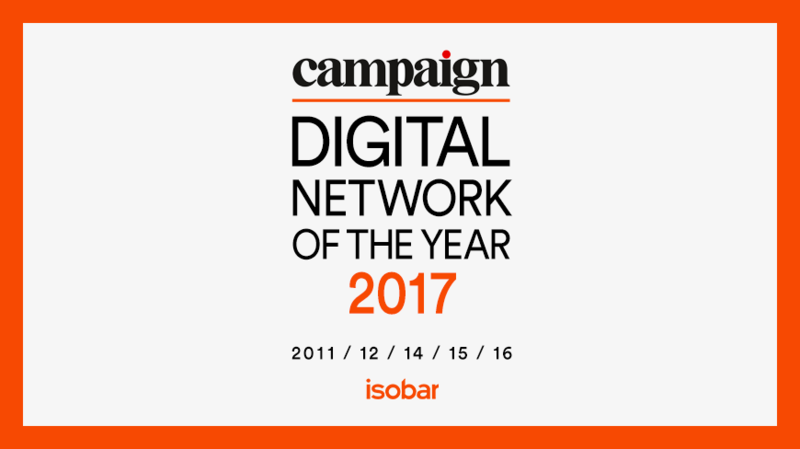 Isobar has had a stellar year with 31 shortlists leading to 13 Agency of the Year titles (7 Golds, 3 Silvers, and 3 Bronzes) and 1 Winner and 2 Runner-ups in the People category, ultimately clinching the Asia Pacific Digital Network of the Year award. Campaign’s Agency of the Year is one of the region’s most prestigious awards, recognising inspired leadership, management excellence, outstanding business performance and overall achievements in the advertising and communications industry across Asia Pacific. In the Digital Agency of the Year category, Gold was awarded to Isobar China Group, Isobar India, Isobar Taiwan and Little Giant-Linked by Isobar (New Zealand). Silver was awarded to Dentsu Isobar Japan and Isobar Korea while WATConsult-Linked by Isobar and Isobar Hong Kong received the Bronze award. A testament to the breadth of Isobar’s expertise, Isobar India also picked up a Gold and Silver in South Asia Social Media and Mobile Marketing AOY categories respectively, while Verystar-Linked by Isobar won Bronze for Mobile Marketing AOY in Greater China. Additionally, Isobar India and Isobar China Group picked up the regional gongs as South Asia and Greater China Digital AOY respectively. “Much of our success this year can be credited to our focus on kick-starting clients on their digital transformation journeys. This meant evolving our agency to reshape the work we do for our clients. We also changed our offering in order to best use our capabilities to creatively unlock the digital potential across three core areas of Digital Marketing, Digital Ecosystems and Digital Products,” commented Jane Lin-Baden, APAC CEO of Isobar. According to a juror, Kaveri Khullar, global marketing head for advocacy, content and partnerships with Johnnie Walker (Diageo), the winning agencies were those that genuinely contributed to the evolution of the industry. “I am not talking about participation at industry forums alone. Some of them really took on the mantle of industry captainship, preparing their own organization and their clients for the digital and tech transformation that is well underway, its significant impact on the empowered consumer and what that means for brands and marketers,” she said. Read more at Campaign Asia.